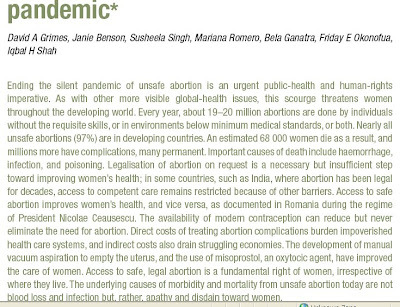 Unsafe abortion: the preventable panemic (PDF) is a pre-print copy of a paper published in The Lancet in October 2006, by David A. Grimes, Janie Benson, Susheela Singh, Mariana Romero, Bela Ganatra, Friday E Okonofua, Iqbal H Shah. It is part of The Lancet Sexual and Reproductive Health Series. Ending the silent pandemic of unsafe abortion is an urgent public-health and human-rights imperative. As with other more visible global-health issues, this scourge threatens women throughout the developing world. Every year, about 19–20 million abortions are done by individuals without the requisite skills, or in environments below minimum medical standards, or both. Nearly all unsafe abortions (97%) are in developing countries. An estimated 68 000 women die as a result, and millions more have complications, many permanent. Important causes of death include haemorrhage, infection, and poisoning. Legalisation of abortion on request is a necessary but insufficient step toward improving women’s health; in some countries, such as India, where abortion has been legal for decades, access to competent care remains restricted because of other barriers. Access to safe abortion improves women’s health, and vice versa, as documented in Romania during the regime of President Nicolae Ceausescu. The availability of modern contraception can reduce but never eliminate the need for abortion. Direct costs of treating abortion complications burden impoverished health care systems, and indirect costs also drain struggling economies. The development of manual vacuum aspiration to empty the uterus, and the use of misoprostol, an oxytocic agent, have improved the care of women. Access to safe, legal abortion is a fundamental right of women, irrespective of where they live. The underlying causes of morbidity and mortality from unsafe abortion today are not blood loss and infection but, rather, apathy and disdain toward women. posted by Everywoman at 5:56 p.m.